We’re big fans of tea time, and I’m planning on adding poetry to our art study, too. We’re also really enjoying Secret of the Andes, though we’re about a week behind on our dictation. Mara has really taken to the French dictation style, and I’m leaving more blanks and adding fewer words each week 🙂 Hopefully by the end of next month we’ll be doing classic dictation! We do art appreciation with our tea on Tuesdays, and today we continued to study the works of Edgar Degas. We completed our study of The Dance Class and moved onto our study of Race Horses. The girls both found very interesting things to say about this painting. One daughter discovered that the racers wore collared shirts, and the other noted that one of the horses looked like it had all the colors of the rainbow in it to make its brown body. 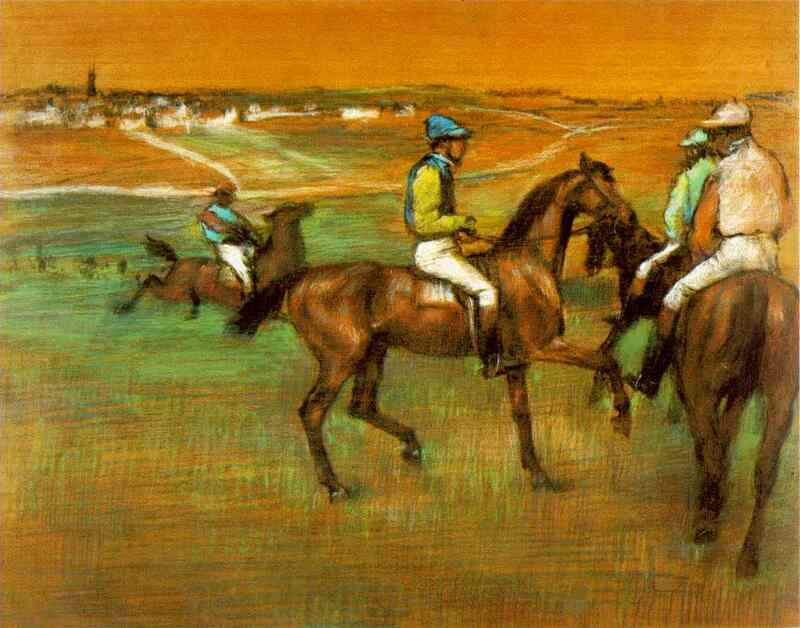 We’ll work with this painting for a few weeks and then move onto others painted by Degas. We also plan on making full use of the National Gallery’s Edgar Degas virtual tour, as well as taking a field trip to the museum.